Lamb Ear Dog Treats are a low-calorie, nutrient-packed snack designed for small to medium breed dogs. 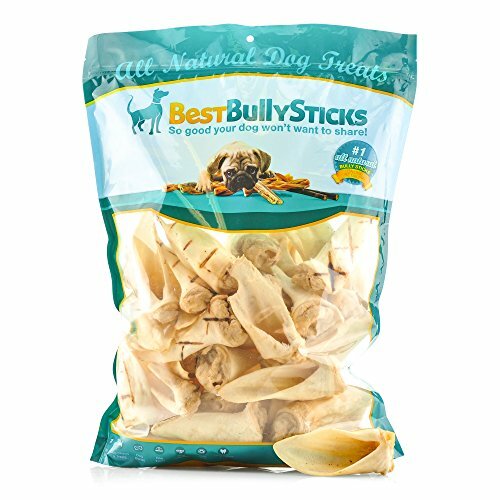 Made from 100% Natural Lamb Meat, Lamb Ear Dog Treats by Best Bully Sticks have the health benefits dogs' need and the authentic meaty taste they crave. Lamb Protein is naturally lean which means your pups will be getting vital nutrients to support a healthy lifestyle. Free of any additives, hormones or unhealthy chemicals, you can rest easy knowing your pup is getting a fully-digestible, safe and tasty treat! In addition to being a great rawhide alternative, Lamb Meat is hypoallergenic, which makes it perfect for dogs with allergies, sensitive stomachs or food aversions. We passionately love dogs and want what's best for them. That's why we'll never skimp on quality. Since 2008, Best Bully Stick's mission has been to provide dog treats with simple and wholesome ingredients at great prices. Our focus is on quality and prioritizing your pet's health and needs with every product that we make. Hypoallergenic Dog Treat: Lamb is an alternative to other meat for dogs with sensitive stomachs. Natural Rawhide Alternative: Lamb ears are 100% digestible and not chemically processed like rawhide dog chews. Free of Additives and Chemicals: Our lamb ears are not made with harsh chemicals, dyes, or scents.